For those wondering if lightning strikes twice, the answer looks to be a resounding, "Yes!" 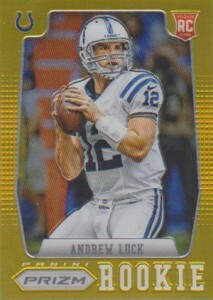 At least when it comes to the 2012 Panini Prizm Football Gold Prizms parallels. Their basketball counterparts have been among the hottest cards of the year. Naturally, there was speculation if that secondary market success would carry over to the gridiron. Numbered to 10, Gold Prizms are one of five parallels found in 2012 Panini Prizm Football. There are also Refractors, die-cut Reds, retail-only Greens and one-of-one Finite Prizms. Gold Prizms are also available for several of the set's basic inserts and rookie variations. 2012-13 Panini Prizm Basketball marked the brand's debut. While boxes came with a pair of autographs, it was the parallels that saw the most action. So far, more than 30 2012-13 Panini Prizm Basketball Gold Prizms have sold for more than $1,000. Three Kyrie Irving's have gone for at least $3,000. Damian Lillard, Kobe Bryant and LeBron James have also seen aggressive bids. It's still very early to tell if football will reach the same heights, but they're still doing extremely well. Two Andrew Luck Gold Prizms and one of his variations have all surpassed $700 and bidding is still open. A Robert Griffin III is over $400. An Alfred Morris sold quickly, selling for $325. For basketball, there's nothing else quite like the chromium-themed Prizm brand. However, with football, it's in direct competition with Topps Chrome, which relies on lots of colorful Refractors. Basketball also has more international appeal where rare inserts and parallels go for disproportionally more than in other sports. Collectors only need to look back to the 2011-12 Fleer Retro Basketball Precious Metal Gems or 2010-11 Panini Totally Certified Certified Green parallels to see recent examples of this. What will also be interesting is to see how excited collectors are for the black-bordered Finite Prizms. With just one of each base card, rookie variation and a selection of inserts, there should be some notable sales in the near future. It it worth noting that the Robert Griffin III Finite Prizm has already been pulled. Basketball also didn't have the die-cut Red Prizms like 2012 Panini Prizm Football does. These fall one per hobby box and are limited to just the base set. A Griffin has already sold for nearly $200. So while it may be unreasonable to expect the 2012 Panini Prizm Gold Prizms to go for as much as their hoops counterparts, the market still seems eager to support them. one thing I hate seeing. Especially on high priced cards. Is seeing them labeled wrong. Gold Prizm people. That’s some bull the Gold Prizms are not carrying the same weight as the Basketball did!! Come on Players like Lebron in Basketball were going for over $1500 while Tom Brady and such are a third of that !! Jamie Case � Agreed. A good chunk of the article looks at why they’re unlikely to reach the heights of basketball. That said, the football counterparts are still doing very strong. 2012 Prizm Factory Sealed Football Hobby Box Russell Wilson RC ?